A rare opportunity to view 100 archival vintage portrait prints of well-known people from the turn of the millennium , photographed and printed by © Rafael Fuchs. The subjects are from different fields of life: Entertainment, literature, politics, sport, music, gaming, high-tech, art, Finance and more. Some of the subjects are: SirJonathan Ive, JK Rowling, Beyonce and Destiny’s Child , Colin Powell, Malcolm McLaren, Barry Diller, Nathan Lane, Howard Bloom, George Plimpton, Dave Eggers, George Steinbrenner, Frank Stella, Paul Cadmus, John McCain, Derek Jeter, Steve Case,Heather Graham, Julia Stiles, John Cameron Mitchell, Bob Denver (Gilligan), James Marsden, Burt Reynolds, Geoffrey Rush, Bobby Flay, Tony Bennett, Alber Elbaz, Arlo Guthrie, ,, …to name a few. A lot of the prints were never seen/ published before. Install of one of the 2 walls in the presentation. Canvas prints by Rafael Fuchs. These are 4 of the prints on canvas that were printed in Zurich in Dec. 2016 for a private collection. They were photographed in the early 90’s and the original artwork was created in a make-shift dark-room that Rafael built in his apartment back then, in the East Village in NYC. 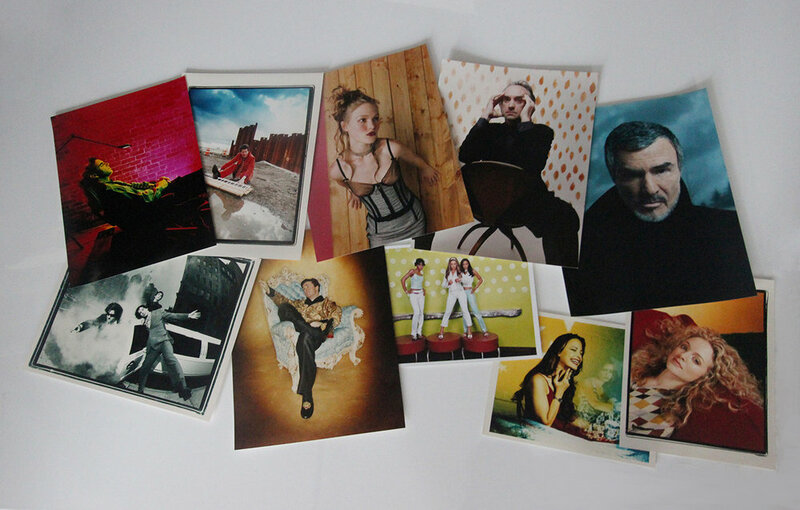 Recently the images were scanned in hi resolution and then printed on canvas. The images include super-models as Christy Turlington, Yasmeen Ghauri, Kate Moss, Cindy Crawford, Linda Evangelista and Helena Christensen, amongst others. These 4 canvas prints are available at the gallery.